My husband, Dave, has started a small and vigorous movement in our immediate neighborhood. He sits on an old vinyl boat cushion and scoots around our front yard digging out weeds by hand. In two years he has gotten rid of most of the weedy growth in our Zoysia lawn. After enduring much joking and pointing by neighbors, he noticed a phenomenon. First, the neighbor across the street was scooting on a cushion, and then the neighbor next door was doing the same. Soon we will have a street full of booty scooters and even better, weed-free lawns to be proud of. If you want to join the Booty Scooting Club, take a look at the fine line of hand tools by DeWit made just for such work. The DeWit Bio Daisy Grubber makes it easy to leverage weeds out of the ground. 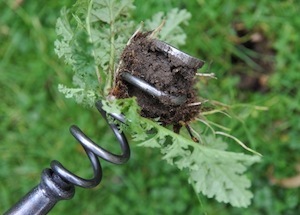 Put the notch on the stem next to the ground, push down on the handle, and pop out deep-rooted weeds. Good for weeds with tap roots, like dandelions. 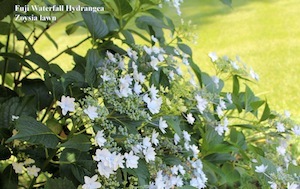 Take it along whenever you are garden strolling. It was initially used to cut asparagus at ground level and it still is good at that job, too. If you are a traditionalist, there is a well-made Dandelion Digger to get down to the taproot of the weed. This finely made tool will not bend in the heaviest of clay soils. Another small tool for the job of getting out the entire root is the innovative Cork Screw Weeder. Just screw it down into the ground in the middle of the weed and pull out the offender. It comes in the short “booty scooting” size and in a longer handled version if you want to remove weeds in the conventional standing position. 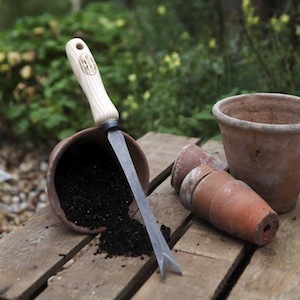 These are just a small number of DeWit hand garden tools that will make your gardening easier and your navigation through the grass a quick and easy trip. Hand forged from boron steel with hardwood handles made of ash (a sustainable wood from FSC Certified forests*) DeWit tools have been handmade in Kornhorn, Holland since 1898. 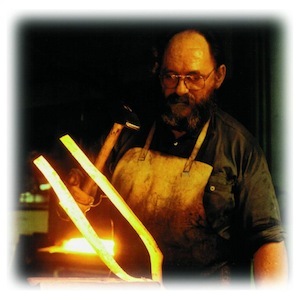 These are heirloom tools with a lifetime warranty. I was sent some small DeWit tools for trial and I can attest to their quality. If you are looking for an excellent weeder, one that you can even pass down to your children, look to the DeWit line of garden hand tools. Start your own Booty Scooting Club. Launch your neighborhood on to a weed-free streetscape of smooth, grassy lawns. We can all have the last laugh and be the envy of the non-scooters. *FSC certified forests are sustainable forests, replanted to keep the forest intact. The FSC (Forest Stewardship Council) is a government entity that oversees this green initiative and certifies that the hardwood comes from sustainable forests. Find DeWit tools wherever fine tools are sold. You can search out your nearest retailer at DeWit Tools USA.